With nearby New Braunfels and Year round Calendar there are lots of things to do! Interested In Finding Out More About Vintage Oaks? 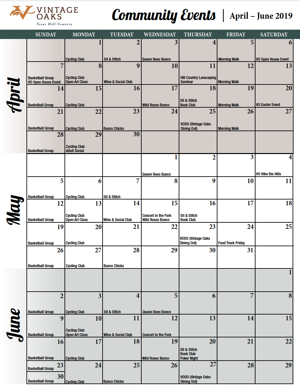 With a year-round calendar and all the best of New Braunfels at your fingertips, there’s always something to do! Discover a new hobby or find a new outlet for an old favorite. Turn new friends into neighbors who share your same interests. Explore the community and all it has to offer, and take a short trip into the heart of New Braunfels to figure out all the reasons why it’s the second-fastest-growing city in the nation. It’s all part of the Vintage Oaks experience. Our calendar is full—and yours will be, too. Numerous planned events throughout the year, from Family Night to the Fitness Expos to the Easter Egg Hunt to our annual Holiday extravaganza, bring out the crowd, and bring the community even closer together. When summer rolls around, Vintage Oaks’ tranquil and scenic Timber Ridge Park transforms into the Texas Hill Country’s premier live music venue for the popular, season-long Summer Concert Series. 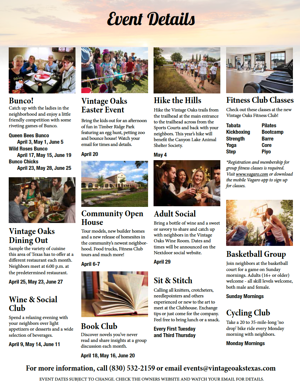 From morning strolls along the community’s miles of winding walking trails to favorite activities like bunco to book club, there are tons of great opportunities to get out, be social, and enjoy yourself every day when you live here at Vintage Oaks. Feel free to just relax and take in the gorgeous Hill Country scenery every once in a while, but don’t be surprised if, before long, you’re ready to get out there for another game of pickleball or even a Wine Social.  After all, Vintage Oaks is located right on the Texas Wine Trail! Or, perhaps you feel called to work on your fitness. You’ll have plenty of opportunities for that when you live here, too, with basketball groups, cycling clubs, and an array of ongoing classes and special fitness-related events at Vintage Oaks’ all-new Fitness Club. View photos and videos from recent events.